The Boon wurrung, the Mornington Peninsula’s traditional owners, called the creek Tji’tjin’garook – the voice of frogs – and they often camped here. Early records tell of emus, koalas, wallabies, great flocks of large kangaroos up to 8 feet hight, and a host of smaller animals and birds, as well as rich fish and plant life. 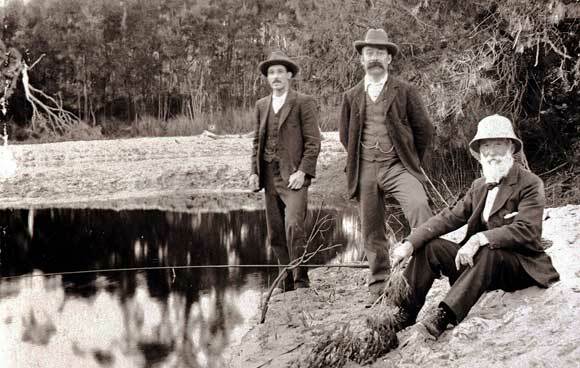 Early white settlers described a creek fringed by Melaleuca scrub. Along the cliff tops was wind-pruned open forest of Coastal Banksia, Drooping She-oke and Moonah. Coastal Tea-tree dominated on the dunes. Beyond was Eucalyptus woodland, becoming denser as one moved inland. Twisted Manna Gums rose above bracken, flowering shrubs and small ground-hugging plants. Captain James Reid, settling in the area around 1840, took “Tichingarook” as the name for his landholding, which included much of the lower reaches of Balcombe Creek. But Reid was not a farmer, and in about 1846 the landholding passed to Alexander Balcombe, who changed its name to “The Briars”, after his birthplace on the island of St Helena. In the mid-1850s, a land survey opened the Mornington Peninsula to increasing settlement, although there were at that time less than 1,300 people in the whole of the Peninsula. The survey defined the boundaries of the large landholders, including the Balcombes, and the lower reaches of Balcombe Creek reverted to the Crown. Allotments along the creek were intended for small farmsteads, but there were few takers. A small hamlet of professional fishermen grew up to the south of the estuary, taking advantage of the rich fishing on Mt Martha and the bream in the creek. There was a market garden, and orchards further upstream. A few wealthy Melburnians began building summer retreats. 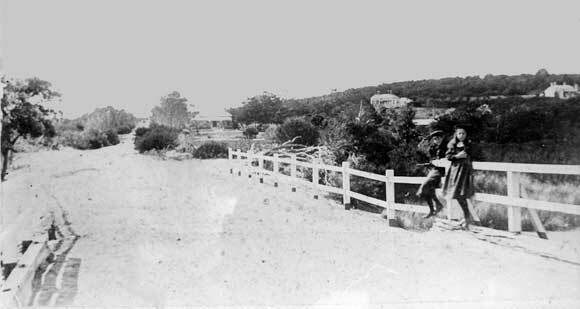 One of the earliest houses was Osborne House, which overlooked the estuary from what is now Seppelt Avenue. It was demolished in 1975. Much of the area’s woodland was devastated by wattle-stripping and tree felling through the 1860s and 1870s. The eucalypts, casuarinas and banksias were culled for firewood for Melbourne and fuel for the local limekilns, and clearing by graziers hastened the process. By 1890, a journalist reported that the rabbits had taken over the denuded slopes of Mt Martha, starving out any sheep local graziers hoped to run there. In the early years of the 20th century, camping became popular amongst the trees on the foreshore by the creek mouth, and along its banks. But development was sparse, fern-banked Balcombe Creek was unpolluted and you could row a flat-bottomed boat almost to the Dromana Road (now the Nepean Highway). The Second World War brought radical change. Most of the lands around the Creek, from the highway to the sea, became Army territory – particularly the area along the south side. 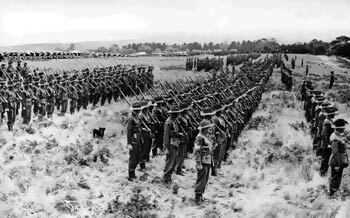 The role of the 4th Army Division was to defend Port Phillip and the Mornington Peninsula, and Mt Martha provided a central and practical location as well as a training ground. The 1st Marine Division of the United States Marine Corps and the ‘SeaBees’ Construction Brigades moved into Balcombe Camp, and the Marines carried out practice beach landings from HMAS Manoora. One estimate puts about 30,000 men in the Mt Martha area at its busiest, though others suggest this may be an overestimation. The creek became something of an open sewer until the camp area was sewered. After the war, the Army Apprentice School was established in 1947 at the Balcombe Camp, and remained on the hill south of Uralla Road until 1982. From about 1944, public camping was allowed back along the creek, power was connected to the camp ground, and fireplaces and camp tables were built. Post-war building in the area, mostly holiday houses, started slowly and steadily gained pace. In 1966, the locals successfully resisted plans for a dredged boat harbour and marina in the estuary. 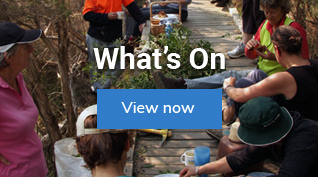 When Mornington Shire Council closed the camp ground in 1984, the Rotary Club of Mount Martha put forward a proposal that an environmental park be established. The Council agreed and four separate but adjacent reserves were declared in 1987. For several years, the Rotarians planted trees, constructed fencing, picnic tables and a jetty, and established a 3.5 km system of paths and boardwalk. 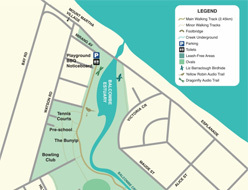 Completed in 2001, the paths and boardwalk connect the foreshore to the Nepean Highway, passing under the highway and linking with the network of walking tracks within The Briars Park. 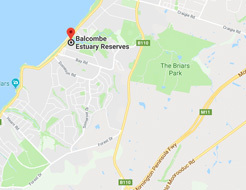 Their work paved the way for the formation in 1997 of the Balcombe Estuary Rehabilitation Group, which became, in 2013, the Balcombe Estuary Reserves Group Mt Martha and is widely known across the community as BERG Mt Martha. “Up the Creek”, the story of the first twenty years of Berg Mt Martha, was written by Mary Stemp and Angela Kirsner. Copies are available from Berg Mt Martha [contact info@berg.org.au] for $35 plus $5 postage.